Being a lefty can be hard sometimes. In this world designed for righties, there are plenty of obstacles for us south paws, especially when trying to write things down. If smudged, inky hands aren't bad enough, most spiral notebooks make it difficult to write with your hand lying flat on the page. Many lefties have been forced to adopt an awkward way of holding the pen to avoid these obstacles. Spanish designer Jaime de la Puente wants to help the eight to 15 percent of the population who struggle with sore, inky hands. De la Puente's team, Imborrable, caters to the lefty population with a series of notebooks called Leftybooks. These unusual notebooks are made specially for lefties to help them avoid the normal problems that come with handwriting notes. Each books flips right to left and is completely spiral free. The lines are slanted downwards, so the writer no longer has to worry about his or her hand running over what they've just written. Ink smudges and awkwardly contorted wrists can be a thing of the past! Normally things this functional come at the cost of style, but not with Leftybooks. The notebook covers come in a number of different designs, each one more beautiful than the last. Lefties can choose from patterns like marble, feathers, or even pink marshmallows. 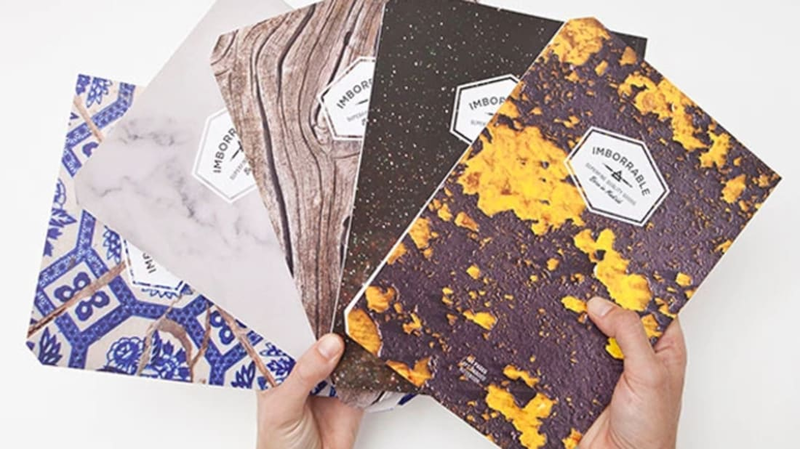 Imborrable is currently drumming up support on Kickstarter to churn out some larger sized notebooks for lefties with lots of ideas to jot down. If you don't want to spend money or need the notebook this very second, they offer a free printable PDF version. All you need to do is share their product on social media and send them an e-mail at type@imborrable.es.